About 32% of hospitals and 52% of non-acute providers -- such as outpatient clinics, rehabilitation facilities and physicians' offices -- are not encrypting data in transit, according to a new survey. 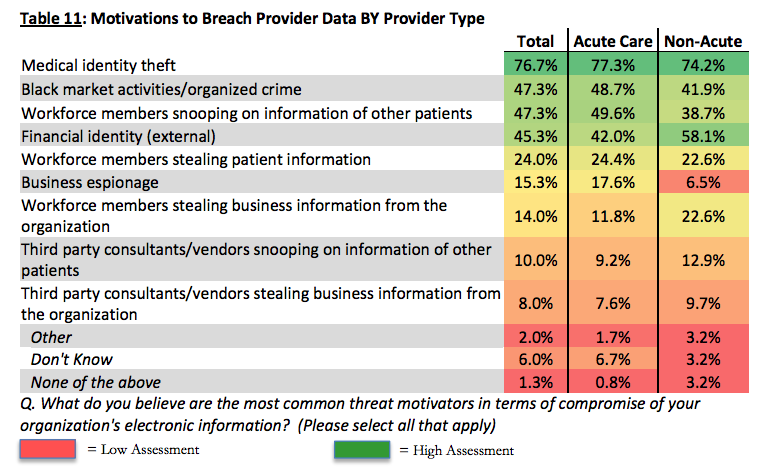 Additionally, only 61% of acute providers and 48% of non-acute providers are encrypting data at rest. This "leaves the door wide open to potential tampering and corruption of the data, in addition to a large potential for a breach," the report stated. "If a computer, laptop, thumb drive, or backup were to be stolen, any person would be able to access such information." The survey, conducted by the Healthcare Information and Management Systems Society (HIMSS), a Chicago-based trade group for the health information technology sector, also revealed that many of the facilities' networks don't even have firewalls. "The results are surprising," the HIMSS report stated, because only 78% of acute care facilities (healthcare systems and hospitals) and 90% of non-acute facilities are using firewalls; some 85% of acute care facilities and 90% of non-acute providers are using antivirus and anti-malware software. 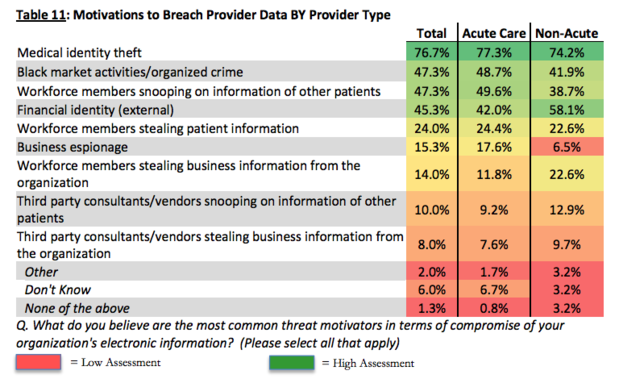 When asked to project the motivations of cyber criminals based on the threats experienced, the vast majority of healthcare organization respondents (77%) cited medical identity theft as the primary motivation. "With tens of thousands of malware variants being generated each day, this lack of defense may leave an organization wide open to compromise," the report stated. "Without the use of a firewall... providers likely lack the ability to prevent or mitigate virus, malware, and other forms of malicious or undesirable software." Firewalls monitor and filter network traffic, so not having them may leave an organization susceptible to compromise. "Simply put, firewalls are a basic component of network security," the report stated. 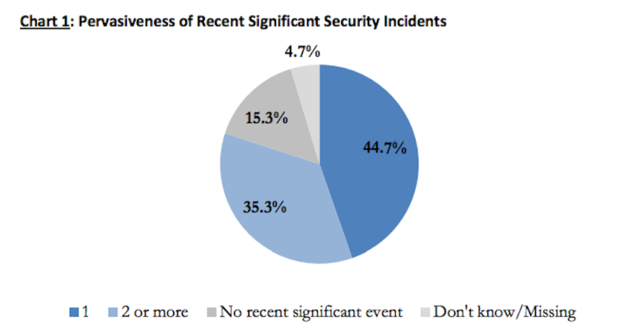 The HIMSS Cybersecurity Survey received responses between February 15 and May 15, 2016 from 119 acute care providers and 31 non-acute care facilities, which included physicians' offices and home health agencies. 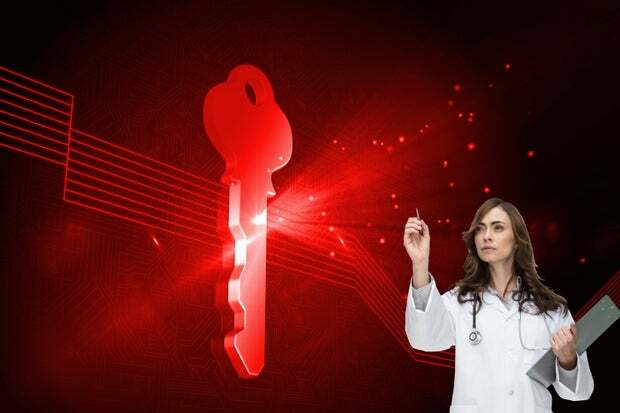 Number one on healthcare providers' cybersecurity concerns was ransomware attacks, through which cyber criminals hack into a healthcare database and hold it hostage until a ransom is paid. Ransomware attacks were cited by 69% of respondents as a significant threat to healthcare IT system security. Healthcare organizations have reason to be wary. Cyberattacks will cost hospitals more than $305 billion over the next five years, and one in 13 patients will have their data compromised by a hack, according to industry consultancy Accenture. A study by the Brookings Institution predicts that one in four data breaches this year will hit the healthcare industry. The recent study by Brookings showed that since late 2009, the medical information of more than 155 million Americans has been exposed without their permission through about 1,500 breaches. 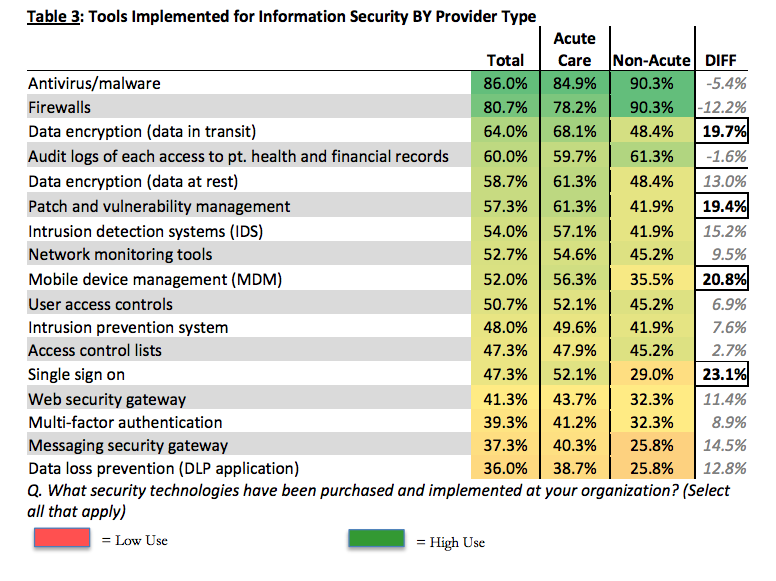 The percentage of acute and non-acute healthcare facilities that have implemented various forms of IT security. The new HIMSS study showed that healthcare IT organizations rely on a limited portfolio of security tools, which may be due to providers lacking appropriate personnel and/or budgets to address their needs. 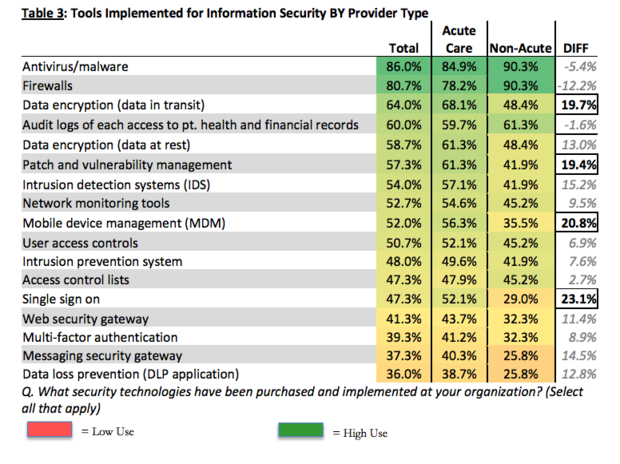 Acute care providers, the study found, appear to have a greater array of security technologies in their portfolio than do non-acute providers. Many healthcare organizations are also struggling with network patch and vulnerability management. Only 61% of acute cate providers and 42% of non-acute providers say they have a patch and vulnerability management program, the survey found. "Essentially, where technology exists, there are vulnerabilities. Such vulnerabilities can sometimes have a high likelihood of exploitation," the study stated. "Without a program in place, there can be a large time window for hackers to exploit an unpatched system (especially if systems are patched or upgraded on a reactive, ad hoc basis). Time is money, including for hackers, and they are likely to go after low hanging fruit."